In 2014, when we launched North America’s first Web programmable thermostat for electric heating, the question was pointless. The answer was simple: we were the only one offering a solution for remote control of line voltage heating – electric baseboard heaters, convectors, fan-forced convectors and radiant ceiling heating systems. But today, it is not that simple. Other options exist. So now, why choose Sinopé thermostats? First, because of all the options available, Sinopé thermostats for the smart home are still the best value for your money. Sinopé thermostats are the most reliable* and the most affordable, in addition to offering the highest number of features to users. Made of high-quality durable materials, Sinopé thermostats allow heating savings that you can actually see and measure. With the “Consumption history” tool accessible on smartphone, tablet and computer, you can view your real-time energy consumption displayed in kilowatt hours, dollars and percentage of use. Choosing Sinopé thermostats means saving money on the purchase AND on your electricity bill so you can plan more vacations, enjoy more outings to the restaurant and spend more time with your friends and family. Second, because Sinopé thermostats are very easy to install and use. Although we recommend installation by a professional, our electric heating thermostats have two non-polarized wires and all our models detect the load they are connected to for a quick and seamless installation. In addition, the Neviweb management platform was designed with the user and their needs in mind. Neviweb is intuitive, bilingual and easy to use, in addition to giving you maximum control over each of your devices and providing valuable information about your consumption. If your home has more than one type of heating (forced air with baseboard heating in the entrance and floor heating in the bathroom), the best move you can do is to choose thermostats from the same company to avoid having a motley house, with thermostats of different colors and styles in every room of the house. Sinopé Technologies is literally a one-stop shop for smart thermostats, with solutions for electric heating, low-voltage heating and floor heating systems. What’s more, we even have a thermostat that controls two types of heating at a time! Lastly, Sinopé Technologies offers its thermostats in different product lines, so that you can choose the communication technology that suits your needs. 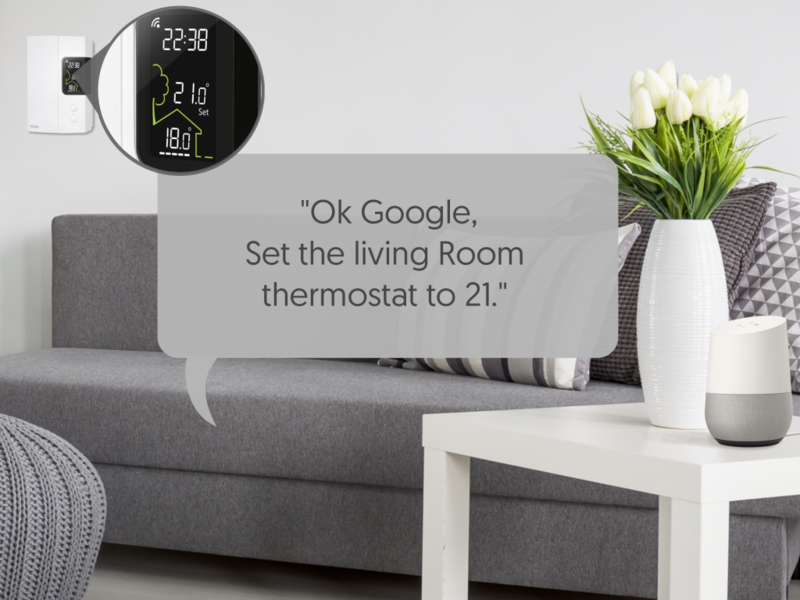 For example, you can purchase a Zigbee smart line voltage thermostat to use home automation platforms such as SmartThings and Control4 and control your device by voice command with the Google Assistant and Amazon Alexa. You can also opt for our turnkey solution with the Web Programmable product line. In short, despite the variety of smart thermostats, Sinopé products remain frankly relevant and interesting for anyone who wants to control their heating systems from everywhere, at any time. * In regards with Sinopé Web programmable and Zigbee product lines. Compared with thermostats using the Wi-Fi communication technology, since they can undergo connection difficulties, slow network communications or intermittent disconnections.